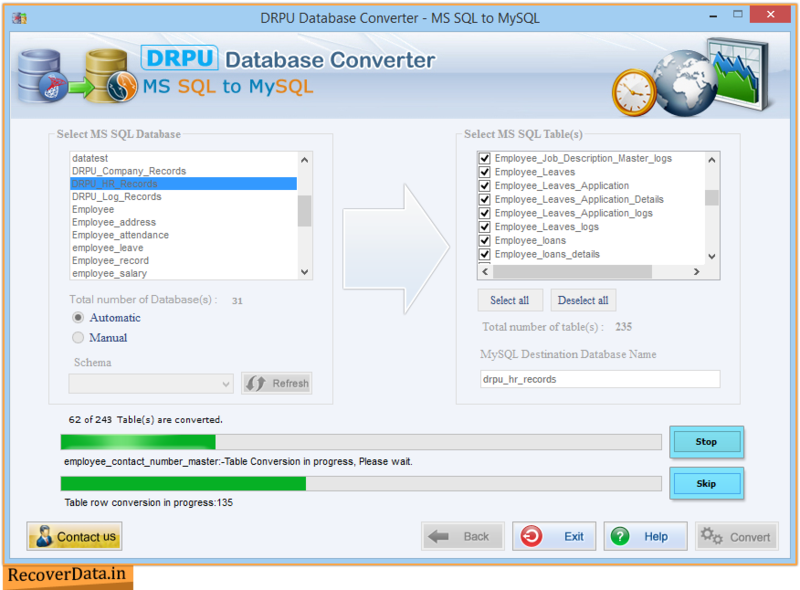 MSSQL to MySQL Database Converter software converts entire or selected MS SQL database records into MySQL database format. Using Database Migration tool, you can easily convert whole MSSQL created database records into MySQL database format or overwrite the contents of an existing MySQL database records. Software has an option to connect MS SQL and MySQL server remotely or locally using Windows authentication or SQL server authentication. Database Converter converts indexes with all necessary attributes, views, stored procedures, queries and foreign keys etc. Software supports null value, default value, data types, entities, attributes or primary key constraints. Software converts complete database or selected database table records of MS SQL server into MySQL server. Converts entire or selected MS SQL database table(s). Supports default values, null values, unique and primary key constraints. Database conversion works with all major versions of MS SQL and supports all MSSQL data types and attributes. MSSQL to MySQL Database Converter supports indexes with all necessary attributes.